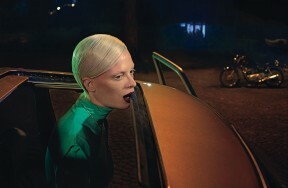 Photographer: Steven Klein. Model(s): Amber Heard. Source: W Magazine. Stylist: Edward Enninful. Makeup: Kabuki. Hair: Orlando Pita. Amber Heard is so nice you’ll have to ‘Look Twice’ in this story shot by Steven Klein for W Magazine. Doubling our pleasure, this powerful piece explores the theme of sensual multiplicity with stunning aplomb. Stylist, Edward Enninful, takes us on a collision course with creativity, where Art meets fashion in the heart of Los Angeles. Daring to bare her secretive side, this girl knows how to glow in Burberry, Prada, Céline, Ports 1961, Alexander McQueen, Hedi Slimane and Givenchy. A dream inside a dream, (Makeup Artist) Kabuki employs a defiant style of beauty, with an updated version of the 1980’s, ‘Robert Palmer Girl.’ This eye defying mix of classic colors keeps the focus on the features, while (Hairstylist) Orlando Pita gives a slicked-back dew that frames the face with avant-garde appeal. “Mindlessly glam fashion photography is a dead or dying art form, and Steven Klein, the anti-fashion photographer, helped strangle it.” Devouring the divine, the soon to be Mrs. Johnny Depp understands, beauty only gets you so far, but without Deppth you are done! !